Whose money is it anyway? - The Straits Times 23 July 2010. 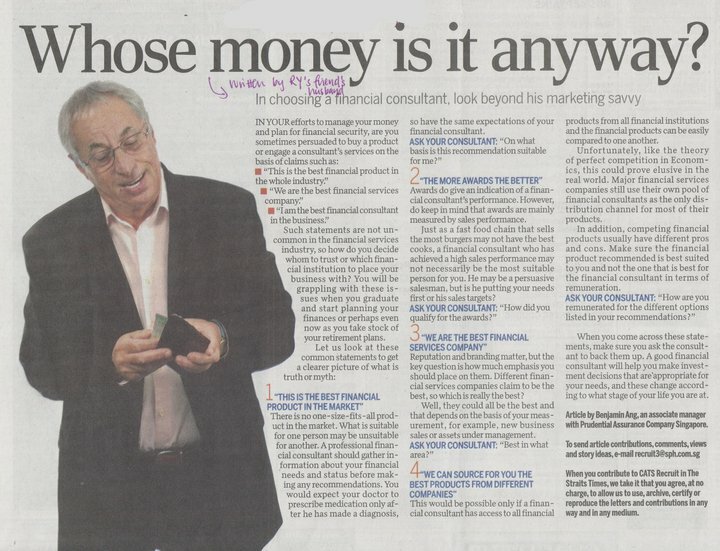 An article written by me about how you should go about selecting a financial consultant by looking beyond his marketing savvy. I tried to make the article as easy to understand as possible and suggested the question to be asked if faced with the common claims made by Financial Consultants or Financial Advisers. Read the article for the full story. This is the best financial product in the market. On what basis is the recommendation suitable for me? The more awards the better. How did you qualify for the awards? We are the best financial services company. We can source for you the best products from different companies. Selecting a good financial consultant may help you a lot more than just saving some dollars and cents.